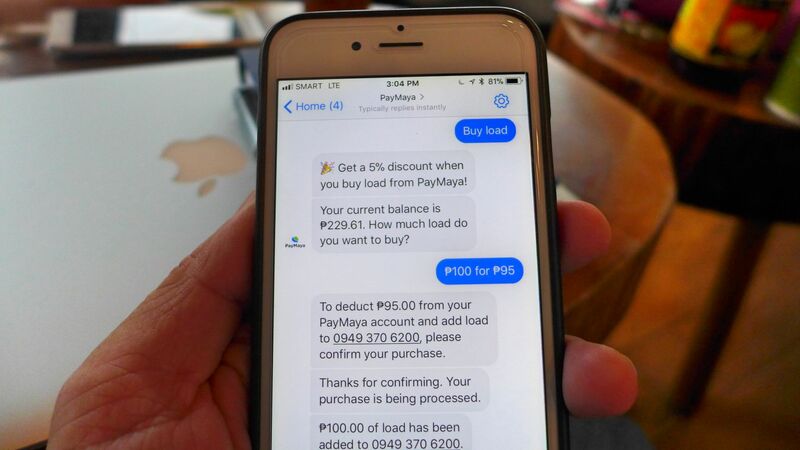 As a long-time PayMaya user and one who has experienced its many benefits especially in travel, I’m amazed at how this digital payment solution has gone one step further with #PayMayaInMessenger. Although I’ve known about this update for some time, I only found time today (a few minutes ago, actually) to link my existing PayMaya and Messenger accounts. I clicked on this link – m.me/PayMayaOfficial – that was provided by the official PayMaya Facebook account and followed the instructions. Pardon the cliche, but it really was a walk in the park. Less than a minute after I put in the mobile number associated with my PayMaya account, I received notification that I would already be able to buy load, pay bills, send money, and deposit cash through PayMaya in Messenger. BUY LOAD ON CHAT. With PayMaya, you can buy cellphone load, pay bills, and send money on Facebook Messenger. I had a field day trying out the many options. I bought load and sent money to my husband just for the fun of trying the transactions out. Stoked to find out I can actually now pay my PLDT bill and Pru Life UK premiums through PayMaya in Messenger. The Visayan Electric Company, NSO, Skycable, Manulife, Cignal were in the long list of billers, too. SEND MONEY. You can send and receive money via PayMaya in Facebook Messenger. What’s even more exciting? There is an ongoing PayMaya Refer and Earn Promo where you get to earn P50 when someone uses your referral link to open or link a PayMaya account on Messenger. Your friend gets P50, too. When you click on the link to PayMaya in Messenger, you actually have two options: link your PayMaya and Messenger accounts or open a PayMaya account in Messenger if you still don’t have one. Wait! There’s more. If share this post and tag 5 of your friends to create or link a PayMaya account on Messenger as a comment, you get a chance to be one of five people to win P1,000 each in PayMaya credits. So what are you waiting for? #PayMayaMoNow.